I got a little write-up in Thrillist recently. That was cool to see, and I’ve noticed some increased traffic to my Etsy shop. 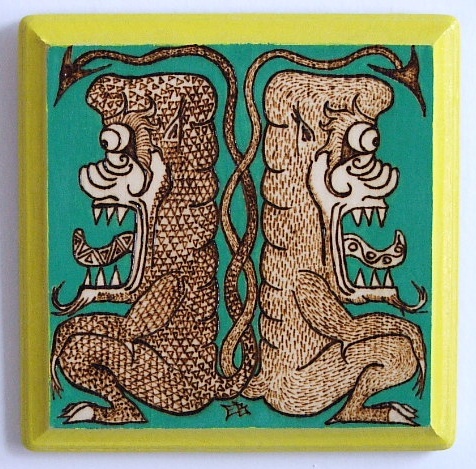 Speaking of which, I’ve posted a couple of new wood-burn and acrylic pieces on Etsy. 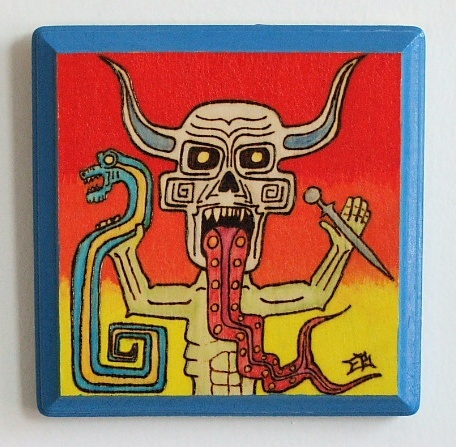 I’m trying to get a group of these smaller paintings out there before I start work on some of the larger ideas I have, since I already know those are going to be more involved. Skull Priest started out as a design for a linocut, and then was turned into this woodburn. I’m basically fulfilling my need to mess with Aztec and Mayan influences here. Siblings was going to be more of the Aztec influence, but I’m seeing a lot more Wild Thing here. What do you think? You are currently browsing the Old Scratch Art blog archives for April, 2011.